I've had aquariums successfully for many years. Part of my success I attribute to thorough research from both the internet and many books such as this one. This is a great book with limitations. Not all freshwater fish are included; 300 of the most popular species are included in this book. What is available is great info such as fish behavior, water conditions it needs, full size of the fish and more. I give this book five stars because it contains so much info that many other aquarium books don't. Many books don't tell you what water a fish needs to live comfortably in, this one does. 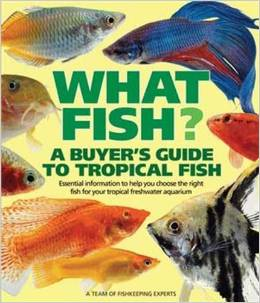 If you are looking for a book that tells you what you need to know about a fish you are thinking of purchasing, or want to learn about what fish to buy for your tank, this is a good book to purchase. Buying fish for your tropical freshwater aquarium can be an uncertain process. This book puts your mind at rest by providing vital information about a wide range of fish. The advice is accurate, up-to-date, and easy to access. As an added bonus, there is a star rating guide to the price you might expect to pay for each fish. Prospective tropical aquarium hobbyists will find vital information on many fish varieties--cichlids, swordtails, and many others. Readers will find tips on species identification, feeding, behavior, approximate and purchase prices. Quick-check data requirements are given regarding aquarium size, water temperature, food, compatibility with other fish, and much more. This title is one in Barron's new series of pet buyer's guides, all of them filled with practical information and approximately 250 vivid color illustrations. That's about it for this time. Until next review, stay safe. Smile! Show compassion to others. Be nice to one another. Read a book and pass it on. Review it. Cheers! Go to your local library and borrow a book and talk about it with others. In Shattered Lies: "It's All About Family." Available now from Black Opal Books and for sale at on-line retailers and indie booksellers. And now for some legal stuff: Copyright 2015 by S.J. Francis. Opinions expressed here are solely those of the author and are meant to entertain, inform and enlighten, and intend to offend no one.